Coretta Scott King Book Awards Donation Grant: Apply Today! Every year, the Ethnic and Multicultural Information Exchange Round Table (EMIERT) of the American Library Association receives approximately 60-100 book titles for the Coretta Scott King Book Awards jury to review, including a full set of that year’s Coretta Scott King Award winning and honor book titles. The Coretta Scott King Book Awards Donation Grant brings these books into the lives of children and their communities. When an organization is selected to receive the grant, it is sent the books that EMIERT collected; those books are used to support innovative projects that foster community connections and children’s access to quality materials and reading opportunities. Any agency or institution serving children who make these materials available to children is encouraged to apply for the grant. Last year, grant recipients included Art Aids Art in Khayelitsha, South Africa, the Uni Project in New York, NY, and a collaboration between the Athens Housing Authority, the University of Georgia College of Education, and Parkview Community in Athens, GA. You can read more about how these organizations are using the books they received in 2018 here. 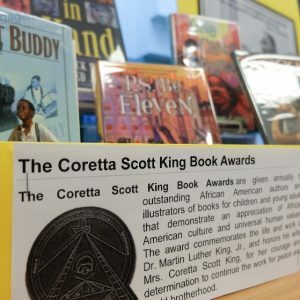 Applications for the 2019 Coretta Scott King Book Awards Donation Grant are now open and will be accepted until January 31, 2019. Applications are accepted from any location, but note that grant recipients must pay for shipping and handling charges. Click here to apply and learn more about the criteria, guidelines, and past winners. Elisa Gall & Regina Carter are Chair and member of the CSK Book Awards Donation Grant Committee, respectively.